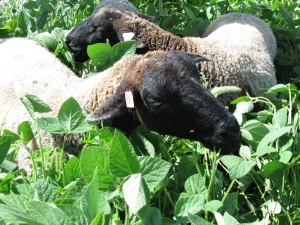 Sheep grazing a soybean green manure, August 2009. Legume green manure crops are the foundation of successful organic grain production systems. These crops are able to partner with Rhizobium bacteria in the soil to fix atmospheric nitrogen (N). When annual legumes are grown specifically for this purpose, they can contribute large amounts of N to the system for use by subsequent crops. In the prairie provinces, a green manure crop is typically required about every third year in order to supply adequate N for other crops in the rotation. While annual green manures provide important benefits to organic systems, a major factor limiting their widespread adoption is that there is no harvestable product and thus no income from that land in that year. Improving the economics of growing annual green manure crops would make green manuring more financially viable for organic farmers and potentially for conventional farmers as well. Grazing green manure crops has been suggested as a possible approach to gaining some income from green manure crops while maintaining most of the N benefit to the following crop. Grazing livestock is known to excrete about 80% of the nutrients they ingest; however, little is known about the effects of grazing green manures on nutrient cycling, the agronomic performance of following crops or the economics of such systems. Field trials were established in 2009 at Carman, Manitoba. Green manures tested in this experiment were oat (non-legume control), pea/oat mix, black lentil (cv. Indianhead), hairy hetch, soybean, and cowpea. Plots of each green manure crop were 4m by 9m. Each plot was later split into grazed and ungrazed treatments (2m x 9m). Sheep grazing an Indianhead lentil green manure, July 2009. Grazing with sheep was initiated in mid-July, when the first green manure crops reached full bloom. Groups of sheep were assigned to each green manure crop. These animals were preconditioned to their assigned crop one or two days before being placed in the actual experiment. This allowed animals to develop a taste for the crop and become accustomed to the fence system, and ensured that excreta returned to the plots was representative of the crop being grazed. Time spent in each plot and the number of animals grazing each plot were based on the quantity of biomass present as well as observations of forage utilization. Sheep were generally moved to a new plot or portion of a plot every 24 hours. Grazing dates and number of animals used are displayed in Table 1. Ungrazed plots were rolled with the crop roller at time of grazing and were tilled with a tandem disc within several days of grazing. Table 1. Description of treatments in the grazed green manure trial at Carman in 2009. Green manure crop biomass was measured immediately before grazing, and residual biomass was measured in grazed plots after grazing to determine percent utilization by the sheep. All plots (grazed and ungrazed) were tilled in early September and soil samples from selected treatments were collected to a depth of 120 cm in 30 cm increments in October. A similar but simpler experiment was also conducted at Oxbow, Saskatchewan, under the management of organic farmer Ian Cushon. A pea green manure was divided into grazed and ungrazed treatments. Green manure biomass was measured at the time of grazing. Ungrazed plots were tilled at the time of grazing, and all plots were tilled later in the season. Soil samples were collected to a depth of 120 cm in 30 cm increments in October. In 2010, wheat will be grown on all plots in both Carman and Oxbow to evaluate the effect of grazing on the N uptake and yield of the following crop. Green manure crop biomass production, including weeds, ranged from 2670 kg ha-1 for cowpea to approximately 6200 kg ha-1 for pea/oat and hairy vetch at Carman. Green manures exhibited differing ability to compete with weeds. 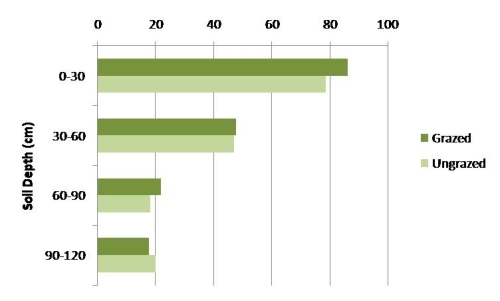 Cowpea in particular was very weedy (72% of biomass was weeds) due to poor cowpea growth. Soybean and lentil were intermediate in terms of weediness, and few weeds were observed in pea/oat, hairy vetch, and oat. The proportions of legume and weeds in the sheep’s diet may have implications on the N cycling in the system; therefore, biomass samples (including weeds) will be analyzed for N content. 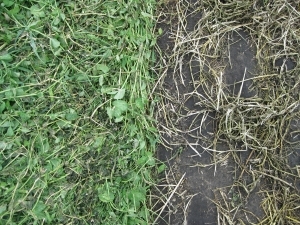 Ungrazed (left) and grazed (right) treatments of a pea/oat green manure, July 2009. Forage utilization in this plot was estimated to be 68%. Sheep were willing to graze all the green manures tested in this experiment, although it did take them a few days to develop a taste for 'Indianhead' lentil. Residual biomass after grazing was difficult to measure because of muddy field conditions and trampling of unconsumed plant material, particularly in viney crops such as pea and hairy vetch. Estimates of forage utilization ranged from 28% for hairy vetch to 82% for lentil. Grazing effectively killed all the green manure crops except oat. This suggests that intensive grazing may be an option for terminating green manures without tillage. Soil nutrient status was assessed at the end of the growing season in grazed and ungrazed treatments of oat and pea/oat. These two treatments were chosen in order to test the effect of a legume vs. non-legume green manure in grazed systems. Both crop type and grazing had signficant effects on soil N at Carman. 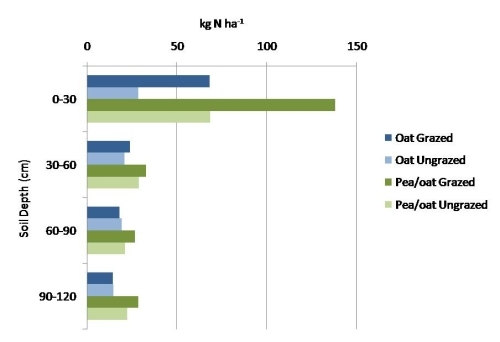 When soil N content was broken down by soil sample depth, it was evident that the greatest effect of crop and grazing was in the surface layer of the soil, where N content in the grazed treatments doubled those in the ungrazed treatments and N content in the pea/oat treatments doubled those in the oat treatment (Figure 1). However, these trends were observed weakly in deeper sample depths as well, suggesting that a certain amount of N leaching may have occurred. High levels of available N in the surface soil of the grazed systems, especially with the pea/oat green manure, are at a high risk of leaching before a subsequent crop can use these nutrients. Growing a non-legume catch crop after the green manure would mitigate this potential problem and could also potentially provide some additional late-season grazing. Grazing did not have a significant effect on soil P or K at Carman. Figure 1. Effect of green manure crop and grazing on soil N status at four soil depths at Carman in 2009. Green manure (pea) biomass production in the grazing trial at Oxbow averaged 2376 kg ha-1. Biomass production was lower at Oxbow than at Carman due to moisture limitations at Oxbow. Soil nutrient status was assessed at the end of the growing season in grazed and ungrazed treatments. Total available N, P, and K were very similar between treatments at Oxbow. We did not see the same effect of grazing on soil N at Oxbow as we did at Carman, where total soil N was much higher in grazed plots than ungrazed plots. When soil N content was broken down by sample depth, there was a small difference between grazed and ungrazed plots in the 0-30 cm depth and the 60-90 cm depth (Figure 2), but these differences were not statistically significant. There was no evidence of N leaching to the 90-120 cm sample depth at Oxbow. The potential for N leaching was likely lower at Oxbow than at Carman due to cool, dry soil conditions at Oxbow. The effect of grazing on soil nutrients may have been smaller at Oxbow than at Carman because of the smaller amount of biomass produced at Oxbow. Figure 2. Effect of grazing on soil N status at four soil depths at Oxbow in 2009. 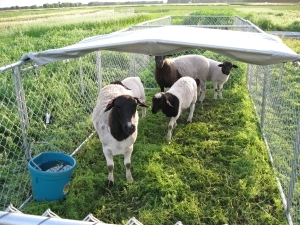 Sheep are willing to graze a wide variety of green manure crops. Intensive grazing can kill an annual legume green manure crop, offering an alternative to terminating the green manure with tillage. Grazing high-N crops such as legume green manures can result in large amounts of available N in the soil. Growing a catch crop after grazing green manures may be required to prevent leaching of excess N.
Future field trials will evaluate the effect of grazing green manures on the following crop. Agriculture and Agri-Food Canada through the Canadian Agricultural Adaptation Program (CAAP). In Manitoba, this program is delivered by the Manitoba Rural Adaptation Council. The Canadian Wheat Board, through the Organic Sector Market Development Initiative. This page created March 2010.